Dream World water Park is located in Athirapally waterfalls and other nearby attractions are Vazhachal, Thumboormuzhy and Sholapur which is also known much and most fascinating and is captured from our eyes. The climate plays the most important role in Kerala. Kerala gives you a heavenly feel which makes us very relaxed because it is fully surrounded by plantations. The nearby mountains present a spectacular view. There are also some waterfalls, trekking paths for adventurous traveler. Another thing around Thrissur is the Amusement park which is most likely by every stage of people. 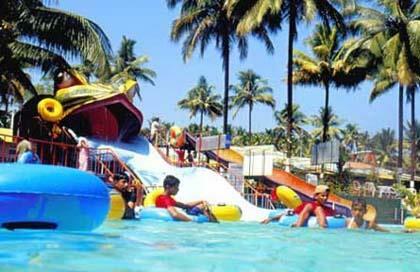 Dream World water Park is the amusement park located in Thrissur. Dream World water Park has 42 land rides and 24 water based rides each having the unique element of fun and adventure. Here the most attraction point is Raft Ride which is a Stormy river comes from the 30 feet height gives totally immense fun to the guests. The park features a wide variety of attractions including some rides, water rides, a musical fountain and laser shows which is reality shows. Silver Storm Amusement Park has a full-fledged riddance floor with a twist electrically controlled rain showers. Other Attractions Dream World water Park are Rain dance is yet another fun filled which is good in fun bomb, snow showers from the side walls with the rhythm of music and rotating colorful lights. For the first time Rain Dance with snow effect is introduced in Dream World water Park. Mermaid pool is exclusively made for children's and ladies. Dream World water Park features conference facilities for up to 1000 persons and features 5 restaurants with a total seating capacity of 1150.it also comes with locker system First aid and Paging system also available. Dream World water Park is one of the only 2 amusement parks in India to implement all attractions and components are maintained accordingly to be at great standards provided to be a safety measure. Almost every ride is maintained with more safety and water processes are recycled every now and then. The park has a water quality control laboratory to monitor quality levels used for different purposes. The Dream World water Park comes with more plantation of about 1000 to keep it an Eco-friendly and also the park comes with the Rain water Harvesting system also maintained with special care with purified with recycling and serves a drinking water and also uses solar energy extensively to heat waters in pools and kitchens. Dream World water Park Holidays also have some more attractions like Dream shower, Zoom Ride, Crazy Cruise, Mat Racer, Amazon River, Dream Splash, Striking Car, Go Kart, Baby Car and more from Dream World water Park.63 Kilometers from to reach Thrissur, Cochin International Airport about 58 Kms. The Amusement Park also provided with the exquisite restaurant with both vegetarian and non-vegetarian menu, Food courts, ice cream parlor and Gift shops are also available inside the Silver Storm Amusement Park. Dream World water Park is getting into the process of setting worldwide and it is going to be set in many other cities since it gets good response from people and their kids.